I know that I really loved last month's recycled packaging and it must have went over so well with everyone else that this month (and I believe onward), that TopBox are letting you pick which type of packaging you want - recycled or the regular print box. To me, it's these little touches that really build up "brand" loyalty. I was already impressed with my box before I even got it! LOL! This first time-fighting eye cream for the delicate eye area diminishes fine lines, puffiness, and dark circles leaving the eyes looking smoothed, luminous and lastingly younger looking. This product was meant those that are 25+ (though, I'm not sure how they came up with that, but sure). 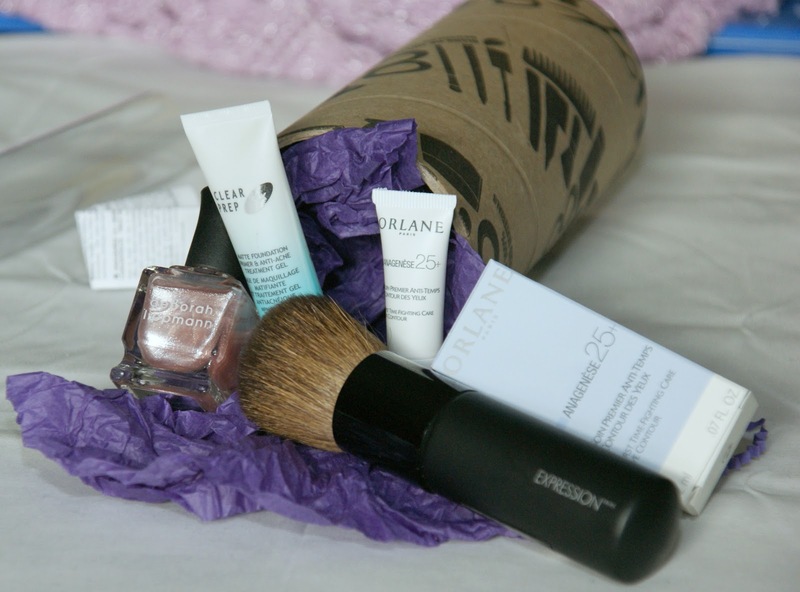 I've never tried Orlane before and I am running out of eye cream, so this is perfect! Unfortunately, as soon as I slid my brush out of the tubing that it came in, it broke into two pieces. *sad panda face* I contacted Topbox and they got back to me within a couple of days and told me that they would send a replacement brush in my June box. How's that for great customer service? (perhaps Loosebutton should take some notes). But my initial reaction was how soft and dense the brush was. I really liked how chunky the handle was because it'll give me greater control. I'm beyond excited to get this polish. I had previously purchased a collection pack of Deborah Lippman polishes but those were glitter polishes, so it's nice to get a "real" polish. It's this beautiful shell-pink shimmer colour. Very sheer and needs at least two coats before you can see any of the pink. It's a perfect colour to put on for those days that you want to wear polish, but don't want to have to pick from your vast collection of polishes (oh c'mon! Like we don't all have at least 10 polishes! :P) It is very similar to Julep's Emma. Emma is more white based and this is one is more pink based. This is an "anti-shine" primer that reduces lines and pores and is long-lasting and easy to blend. It's a lightweight gel that helps prevent and heal acne blemishes. I was actually looking at purchasing this primer, so now I can try it out without having to purchase the full size! I don't know how Topbox always manages to impress me. I really liked this box and I'm really impressed with their customer service. Despite not getting as many samples as the other boxes, this is one is probably my favourite beauty box. If you haven't already, remember to enter my 50 Followers Giveaway!!! Is this box available in the US? Hi! Unfortunately this box is not available to people outside of Canada. Look at how nicely everything is displayed! Topbox should use your picture in their FB timeline! :P Thanks for the compliment! Love all the products you received! I have been using the coverFX primer and loving it! I will def buy the full sized when this generous sample size is finished! I started using the primer too and I really, really like it!! !